The LANCOM WLC-4006+ is a powerful WLAN controller with central WLAN management for installations with up to 30 access points. The distribution of firmware updates and configurations takes place via only one device - a massive assistance and time saver for every administrator. 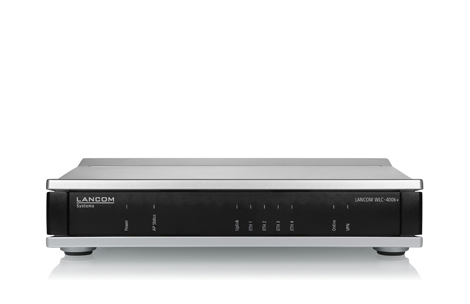 With the LANCOM WLC-4006+ up to 30 access points and WLAN routers can be configured and managed automatically and centrally - a massive assistance and time saver for the administrator. This way the WLAN controller offers a consistent network control, security, and reliability. Quick and easy network integration of new access points as well as automatic configuration rollout – without the need of manual configuration. 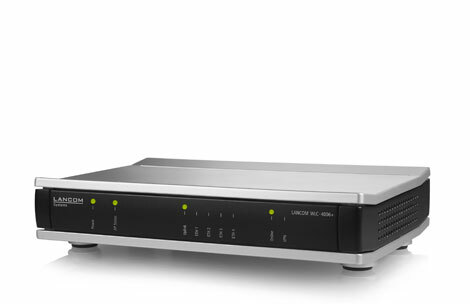 After network authentication, the LANCOM WLC-4006+ immediately sends an appropriate configuration to the WLAN device. LANCOM WLAN controllers assure the communication between the administrated access points and WLAN routers. This way, clients can be passed from one WLAN device to another – crossing two radio fields – without any connection losses. Thanks to extensive virtualization and security functions, wireless networks can be set up efficiently and compliant to the proprietary security policies. The integrated VLAN functionality enables the separation of several wireless networks in only one infrastructure. Furthermore, there are professional security functions which allow the administrator to grant network access only to authorized clients. The LANCOM Smart Controller principle assures highest operational security: While administration data is transferred via the controller, traffic data is sent directly from the client to the access point and therefrom directly to the router. If one controller breaks down, the access point switches to “stand-alone mode” in order to maintain the communication between client and access point. This way, there are no unproductive hours due to employees not getting Internet access or the failure of WLAN-based machines. The LANCOM WLC-4006+ supports the WLAN optimization concept LANCOM Active Radio Control. This intelligent combination of innovative features included with the LCOS operating system – such as Band Steering, Adaptive Noise Immunity, RF Optimization, and Client Steering – sustainably increases WLAN performance and supports administrators with professional tools for WLAN management. Thanks to the integrated hotspot functionality the LANCOM WLC-4006+ is ideal for providing a public Internet access. Users benefit from a hotspot that is secure and easy-to-use, while hotspot operators can be sure that their own network remains separate from the hotspot. Highest operational reliability without "single-point-of-failure"